Oneida County has implemented several repair and rehabilitation projects throughout the Oneida County Sewer District. This work is designed to repair sanitary sewers to prevent stormwater and groundwater from infiltrating the system and contributing to overflows into the Mohawk River. Rehabilitation is conducted, whenever possible, using trenchless technologies. This means that the work – which may include manhole rehabilitation and/or sanitary sewer rehabilitation (cured-in-place liners, grouting, spot repairs, etc.) – is mainly performed in existing trenches without any ground disturbance. This is the most cost effective, least invasive method to restore the aging infrastructure to like-new condition. Refraining from using washing machines and dishwashers. Refraining from using the bathtub or shower (or leaving water in the tub until service is restored). Disconnecting any sump pumps that are connected to the sanitary sewer system. Sump pumps that discharge into the back yard, drainage ditch, or a drainage pipe do not need to be disconnected. The contractor will make advance notifications to homeowners affected by the process. Notification will be made via direct delivery both one week and 24-hours in advance of the scheduled work. Sewer rehabilitation will be ongoing in targeted neighborhoods throughout the District. Check back often for a revised schedule. There is work going on in my neighborhood and I smell Styrofoam/plastic. Should I be concerned? Neighbors in the area may detect odors (like plastic or Styrofoam) while the work is occurring. 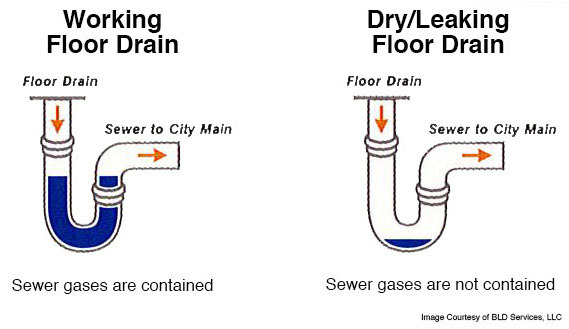 Odors are most likely to occur in houses or buildings with dry or non-existent traps. The purpose of the sewer trap is to maintain a water barrier in the pipe to prevent sewer odor and gases from entering your home. In most cases, any odors can be minimized by pouring several gallons of water down your sinks, showers, toilets, etc., and by opening your windows. If you detect this odor after pouring water into all of your plumbing fixtures (including floor drains), contact your plumber to locate and repair the source of the odor. If you have additional questions, contact John Waters, Oneida County Department of Water Quality and Water Pollution Control, at 315-798-5656. The purpose of the sewer trap is to maintain a water barrier in the pipe to prevent sewer odor and gases from entering your home. I didn’t receive a work notice, but there are crews working on my street. Is my home affected? It depends on the nature of work that is being completed on your street. In some cases, your home may not be connected to the affected pipe. In other cases, the work you are seeing may be a completely separate project that will not result in an interruption to your sewer service. If you have additional concerns, please contact us. Do I really have to disconnect my sump pump? If you have a sump pump that is connected to the sanitary sewer system, yes, please disconnect it per instructions contained within your 24-hour notification. If your sump pump drains into a storm sewer, onto your lawn, or into a drainage ditch, you do not need to disconnect your sump pump. Please contact us with any additional concerns. I saw a broad range of dates for work in my town or village. Do I have to refrain from allowing water into the sanitary sewer system for that whole time period? No. Please refer to the tentative schedule and personal notifications for more details. Is this schedule subject to change? Yes. Please use the provided schedule as an approximate estimate as to when work will be completed in your area. These dates are expected to vary. You will receive a notice one week and 24 hours prior to work beginning in your neighborhood. Though we will update our schedule on this site as frequently as possible, please use the date contained in the notices as the final date. Is work going to be done on every street in every municipality? No. Only select streets and homes will be affected. You will also receive a notice in your mailbox or on your door one week and 24 hours prior, letting you know if your residence or business is affected.